As many of us prepare for the excesses of Christmas, over 700 volunteers at the Hackney Winter Night Shelter are making their own preparations to ensure society’s most vulnerable have somewhere warm to sleep. Thanks to a huge response to the shelter’s call for more support, that figure of 700 volunteers far exceeds the 500 or so people normally needed to help keep it running. The shelter usually runs from the end of December until March, but this year, for the first time, it opened its doors in November and will also be operating throughout December – hence the need for more volunteers. Katherine Harding, a volunteer who helps communicate the work of the shelter, said they had only been able to extend their provision this year through the goodwill and enthusiasm of those new volunteers and churches who got involved. Each night the shelter sets up at a different church in the borough to address the need for emergency bedding and provisions at a time of year when nightly temperatures regularly drop below freezing. Apart from beds, the shelter also provides social interaction and a hot meal for its homeless guests – all things that may have been missing from the holiday season. For the three months leading to April this year, the shelter catered for up to 25 people every night, served over 2,000 suppers and breakfasts, and helped 45 people find stable accommodation. Thames Reach, a London homelessness charity, provides experienced support workers who serve in partnership with the shelter and specialise in caring for the homeless. The shelter also has two experienced full-time support workers of its own to help guests with any physical and mental health issues or addiction problems they may be facing. “There’s a huge range of difference in how much we need to intervene with someone and what kind of help we need to find for them,” said Ms Harding. Aside from caring for health needs, more permanent solutions to homelessness are tackled such as help with finding employment and secure places to live. A significant indicator of the shelter’s positive influence can be seen in the many guests who return as volunteers to work alongside those who are mostly helping out for the first time. 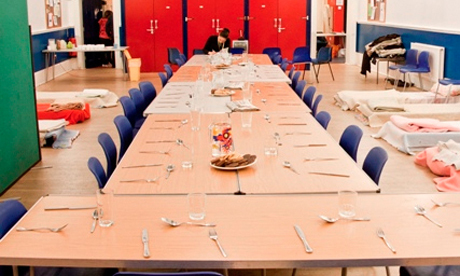 Hackney Winter Night Shelter is funded by grants and private donations as part of an umbrella organisation, Hackney Doorways, which offers continued support when the shelter closes. More information about helping out in 2012/13 can be found at Hackney Winter Night Shelter.